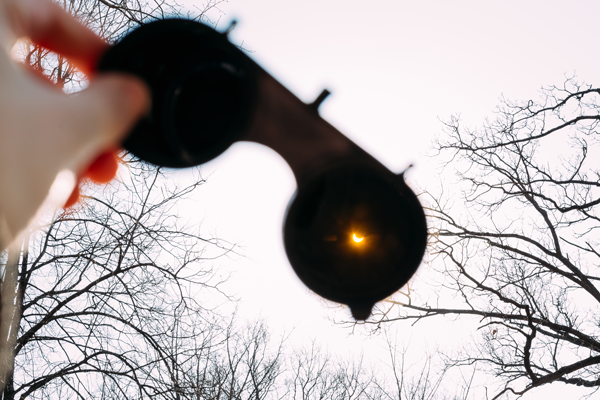 (TNS) RALEIGH, N.C. — With the solar eclipse arriving on Aug. 1, eclipse viewing glasses are in high demand among people hoping to get a glimpse of the rare event. But NASA, the National Aeronautics and Space Administration, warns that many eclipse viewing glasses on the market may be unsafe. Many glasses may not have lenses that are certified by the International Organization for Standardization (ISO), meaning their lenses may not provide adequate protection from looking directly at the sun, according to NASA. Looking at it without proper protection can cause serious and permanent damage to your eyes. Eclipse viewing glasses are necessary to look directly at the eclipse while the sun is partly covered. During the two-minute “totality,” when the sun is completely blocked, it is safe to take the glasses off — but most places are not in the path of totality. NASA recommends buying eclipse viewing glasses from any one of just five companies: American Paper Optics, Baader Planetarium, Rainbow Symphony, Thousand Oaks Optical and TSE 17. American Paper Optics is the largest of those companies, with sales reaching 500,000 pairs of glasses per day in the weeks leading up to the eclipse, according to USA Today. NASA also recommends eclipse viewers ensure that the ISO certification number 12312-2 and the manufacturer’s address are printed on viewing glasses. Solar eclipse glasses can be bought in stores, including some Walmart and Lowe’s Home Improvement locations, according to the American Astronomical Society, which helped NASA compile a list of reputable manufacturers. But glasses from companies not recommended by NASA are readily available online, where it is sometimes hard to tell the difference between safe and potentially risky glasses. Beware on Amazon: among the top 50 results in an Amazon.com search for solar eclipse glasses, none of the five “Sponsored” products were manufactured by one of the NASA-recommended companies. Of the eight “Best Seller” glasses in that search, three claimed to be manufactured by American Paper Optics and one by TSE 17. The other four were manufactured by companies not included in NASA’s recommendations. Online news outlet Quartz reports that some of the American Paper Optics glasses sold on Amazon are counterfeit. A key identifier is the shape of the earpieces; authentic APO glasses have a squared-off earpiece shape, while counterfeit APO products may have rounded ears, according to Quartz. Many Amazon reviewers complain that the glasses received do not match the certification description on the site.